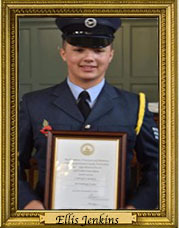 RAF Air Cadet: Cadet Flight Sergeant Ellis JENKINS-1166 Welwyn Garden City Sqn. I am Ellis Jenkins and I live in Welwyn Garden City in Hertfordshire. I study Level 3 Hospitality and Events Management at Oaklands College in St Albans after studying one year of Professional Cookery Level 1. When I leave college, I hope to obtain a management role in a high-class restaurant, and one day hope to open and run my own restaurant. As well as studying I have a part time job at Auberge Du Lac on the Brocket Hall estate. I have worked there since April 2018 and thoroughly enjoy working with my colleagues and learning new skills along the way. 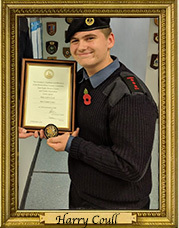 I have attended RAF Air Cadets for nearly four years now and have progressed through the ranks as well as gaining qualifications and skills along the way including first aid, shooting and The Duke of Edinburgh Award Scheme. I am enjoying meeting and talking to new people and attending lots of different engagements with the Lord Lieutenant and can’t wait for the events in the months to come. 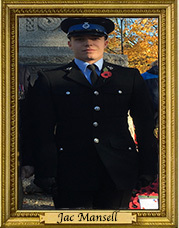 My name is Harry Coull and I was born in Welwyn Garden City; I will be 16 years of age in early April this year. I attended St. Johns Digswell primary school, and I currently attend The Sele School in Hertford where I will taking my GCSEs later this year. I plan to continue at school and complete my A-levels in Mathematics, Physics, and Chemistry, alternatively I may goto Oaklands college in Welwyn Garden City and undertake level 3 Extended Diploma in Engineering as I intend to join the Royal Navy as an engineer. I joined the Sea Cadets at the age of 10 and have thoroughly enjoyed my time there. The first qualification I earned was Basic Piping. I have been to HMS Raleigh and HMS Excellent to do 2nd and 1st class qualifications. My proudest moment, apart from gaining the title of The Lord-Lieutenants Cadet, is getting my 1st Class Seamanship at the age of 14 years. I’m now working towards my Master Coxswains badge as well as my Mechanical Engineering 2nd Class. 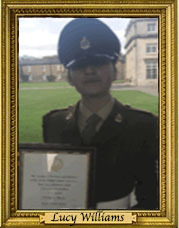 new role of a Lord Lieutenants Cadet. My name is Jac Mansell, I live in Harpenden. I have just finished my education at college and looking to join the local police service. I have completed a Level 3 extended Diploma in Public services. I have been a police cadet for three year and completed many large events. In my first two years of being a cadet, I have had the opportunity to attend the county cadet competition wining it both years running. 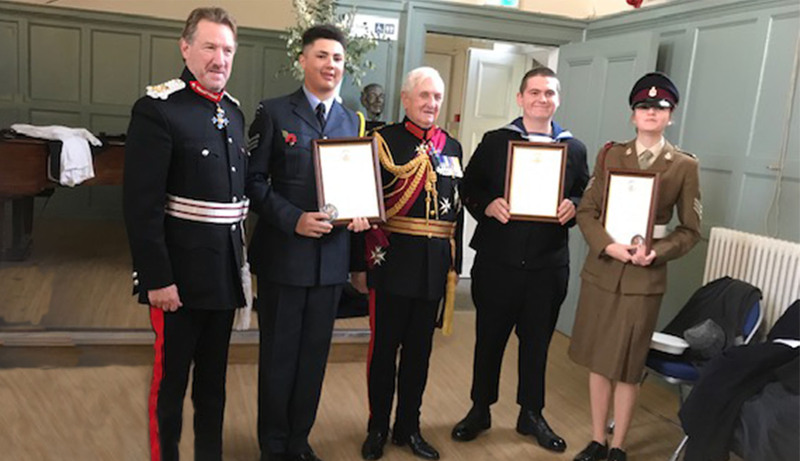 My greatest achievements have been being named one of the Lord-Lieutenant’s Cadets and winning cadet of the year for Hertfordshire Constabulary, after helping establish the mini cadet scheme in Hertfordshire. The Lord-Lieutenant thanks the retiring cadets-Cadet RSM Hukins, Able Cadet Andrews and Cadet Flight Sergeant Baker and Police Cadet Ozkaratas for their hard work and support at numerous events during the last year and wishes them all well for the future. “Through the role I was able to see the important work that you and many others conduct as Lord Lieutenants. I was struck by your selfless commitment to the people of Hertfordshire and to the plethora of charitable organisations that your office strives to recognise and reward. The past year has enlightened me to the integral role of charities and youth organisations within the county. Having attended events across Hertfordshire, I have been both impressed and humbled by the unwavering effort of the so many volunteers that make me proud to be a member of this community. Meeting HRH the Countess of Wessex and TRH the Duke and Duchess of Cambridge in the same week was a great experience . The Commonwealth service at St Albans Cathedral with the opportunity to meet High Commissioners – a brilliant day despite the icy weather. Your attendance at the 10 year amalgamation parade held at CTC Bassingbourn was especially appreciated as you awarded me with two of the highest Army cadet achievements. A particularly memorable day was when HRH the Earl of Wessex came to the University of Hertfordshire, it was a privilege to be seated next to him at lunch and I can still recall the sweltering heat we endured in our uniforms that day. The visit to the Herts Samaritans annual meeting will stay with me. Mental Health awareness is an especially important subject to me and I hope to follow their example in working to destigmatize it and help those who are afflicted. Finally, the Remembrance parade at Haileybury and the chance to meet Field Marshal Sir John Chapple was a fitting end to what was an amazing year. As I retire, I have absolutely no doubt that S/SGT Williams will serve you well as my successor. I, however will remain unequivocally busy with my A level exams in June (for which I am predicted three A* grades) and University thereafter to read History. Whilst I cannot fathom what my future holds, I hope that I will one day be able to contribute to our county and country in the way that you and many others do. Please pass on my best wishes to the Vice-Lord Lieutenant, Siobhan and the Deputy Lieutenants for their commitment and kindness.